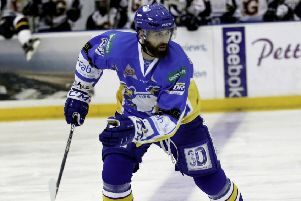 Fife Flyers took a major step towards securing the conference title with a crucial 5-2 win over Braehead Clan tonight. It gave them a four point cushion over their Renfrew rivals at the top of the table, with two games in hand – and it stretched the gap with third placed, in-form Dundee Stars to six. Flyers played some outstanding hockey, particularly in periods two and three, when they seized the momentum with the line of Shayne Stockton, Carlo Finucci and Charlie Mosey doing all the damage. With Josh Scoon playing a solid supporting role to the trio, they bagged every goal and almost all of the assists as Flyers finished the game strongly. Finucci fired a straight hat-trick, but even that wasn’t enough to claim the MoM award from Stockton, who scored twice and bagged two assists, while Mosey was a workhorse across the 60 minutes. Flyers went into the first break 2-1 down, but a 2-0 middle period gave them an advantage they never looked conceding. The win took them back into fourth spot in the Elite League, and they remain on course for their highest ever league placing. Todd Dutiaume, head coach, was delighted with the win – and the performance. ‘‘We needed a result like that tonight,’’ he said. ‘‘Apart from part of the first period, this was an excellent performance.